According to written records the Society was founded in 1920 and held its first St. David’s Day celebration on 1 March 1921. We have no further written records until Thursday, 8 April 1937. From then till the present day we have hand-written minute books. These are presently kept in Edinburgh City Archives where they can be viewed by appointment. 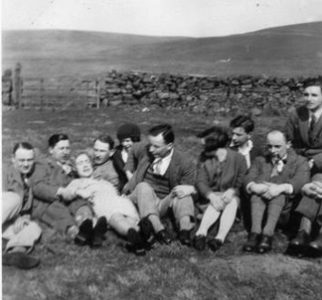 We have photographs from May 1929 to the present day: the first being this group picnicking in the Pentlands. We have the Society Bible, presented to us by Welshmen serving with the Royal Army Pay Corps on 26 May 1945, in recognition of the hospitality shown to them by our members during WWII. Inscribed inside is the “Welsh (Cymmrodorion)(sic) Society Roll of Honour” which has been kept up to date to note the passing of members of the Society. It is from these documents and word of mouth recollections of long standing members, that we can piece together a flavour of Society activities. The fixed point of the year is naturally the Saint David’s Day celebration. Initially a “Social” evening, with a programme of entertainment and a catered “tea”, it has now become a more formal Dinner with a Guest Speaker, and always concluding with community singing. 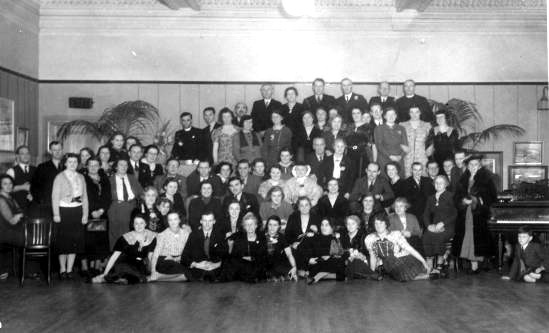 Here we have a photograph from the Album dated 1938, and from the minutes book of that time we know that Mrs Pool was President, and that the Social was held at Foresters’ Hall at a charge of 1/6d per person. Over the years the programme of Summer outings, Social evenings and Welsh Church services, was enlarged by the introduction of talks, visits to places of local interest, and mock Eisteddfodau. The Eisteddfod, usually held on a Saturday in early February, provided an afternoon and evening of enthusiastic competition with a programme of singing, recitation, acting, instrumental music, and drama. There were various categories of arts and crafts, and the entries in the cookery section, once adjudicated, made a splendid tea. The evening ended with the literary competition, the winner being awarded the “chair”. For many years this much prized trophy was a beautifully hand-made miniature chair carved by Mr Jim Graham of Fife. The best items from the Eisteddfod were reprised at the St David’s Day dinner. For many years a series of joint Cymanfa Ganu were held, hosted in turn by the Welsh Societies of Edinburgh, Glasgow, Aberdeen and Dundee. This (sadly undated) picture was taken in Edinburgh and shows the popularity of these hymn singing festivals. Sadly, the Dundee Society is no more, and the joint Gymanfa seems to have run its course. Edinburgh still holds a mini Gymanfa on the Sunday following St. David’s Day.